More often than not, most basic insulation needs can be addressed with traditional loose-fill insulation or batt insulation installed into your walls. Over the years, our experience in the industry has taught us many alternative ways to solve a problem, and address heat loss and sound attenuation. We don't suggest these solutions at first because our objective is to "keep it simple, and keep it affordable" but if you have a special circumstance, challenge us to come up with a solution. Often there is limited room, a higher than normal R-value requested, a lack of framing or backing, or just something that can't be addressed with traditional insulation. 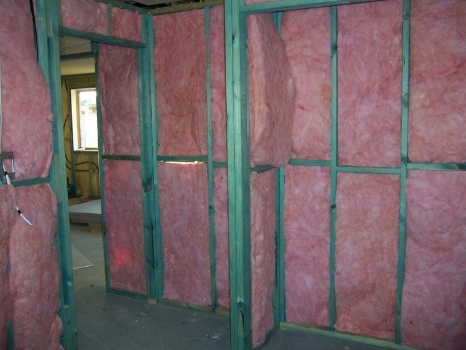 We are the insulation experts, and we can generally solve any problem. Here are some examples of the types of solutions we offer. 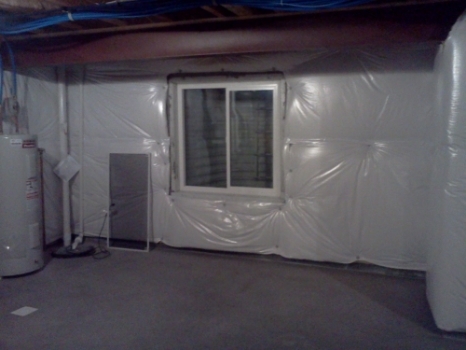 What is your vapor barrier? Essentially, the vapor barrier is the polyethylene sheet that is installed on the warm side of the trusses, underneath your drywall or other ceiling finish. It is intended to control where the point of condensation is, and keeps it in the warm space instead of in the attic. 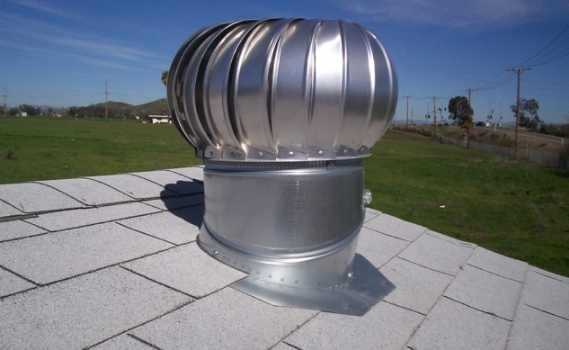 This prevents wood rot, and excessive moisture and frozen moisture in your attic. When your point of condensation is on the warm side, warm circulated air can burn off this condensation and keep moisture from causing problems such as promoting mold growth, water stains, shingle damage, ice dams, etc. 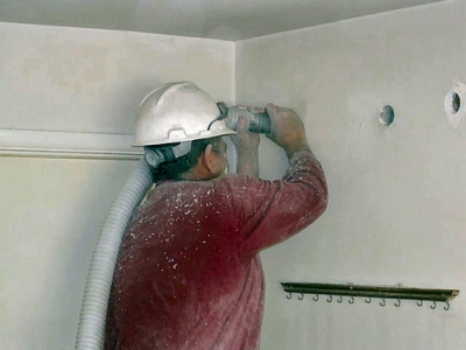 Many homeowners are concerned about the lack of vapour barrier that older homes have. Before the mid 1980's very little attention was paid to the vapour barrier underneath your attic insulation. Many homes have a 2mm vapor barrier (today's requirement is 6mm) with lots of tears and penetrations in it, and war era homes have no vapor barrier installed at all. While this is not automatically a guarantee of problems, if your attic is exhibiting these moisture complications, you may wan't to address it. With a solid vapor barrier, you are also slowing down heat loss, and getting a more perfect seal on your attic, thus a more efficient heating bill in the winter. The biggest problem in addressing it, is that it's a fairly expensive process. Previously, your only option was to remove the drywall on the ceiling and instal a barrier, and then re-drywall your ceiling. Wit the Hybrid foam + loose-fill insulation option, we have found a way to get the best of both worlds. A spray foam barrier in the attic, and the price efficiency of loose-fill insulation in lieu of a full R50 spray foam installation. It's a three step process. First: we remove your insulation, giving you the opportunity to renovate your electrical or address other areas of concern in the attic, and clearing the way for a complete seal on the back side of the drywall. Second: We install air chutes to all of your perimeter soffit areas (if required/possible), and install a 1" -2" closed cell 2lb spray foam insulation (R10 value) to the entire back surface of the drywall creating a vapor barrier that seals all of your penetrations and seals up against the air chutes on the perimeter. Third: We install a cost-effective (cheaper) R40 loose-fill premium fiberglass insulation over top of the spray foam to complete the upgrade to an R50, with a completely solid vapor barrier underneath. By combining a limited depth of expensive spray foam with the cost effective loose-fill insulation, they hybrid solution is able to give your the best performance characteristics of both products, at a fraction of the cost of installing a full R50 of spray foam in the attic. The entire process is more costly than a simple upgrade, but offers a complete retro-fit upgrade of your vapor barrier without disturbing your interior finish. It's not recommended for every situation, but if you are living in an older home that you love, and plan on living in for many years, we normally recommend it. Natural gas, and carbon tax levies are not going to get any cheaper, and you are future proofing your home. We have a vendor that will custom make blanket insulation for us in R8 or R12 specifications with a finished high strength surface that can be hung in places where there is limited or no framing to fit traditional friction fit batt insulation. This is most commonly used in crawlspaces, unfinished (unframed) basement frost walls, skylight wrapping, pipe and ductwork wrapping, etc. When used in combination with reflective insulation, we can often achieve a high R-value performance that will satisfy your expectations.